It is Mid Semester: Are you on track? This message is for my St. Clair College and University of Windsor students and any other students who are reading. It is mid semester. Are you track for doing well in your studies? Are you succeeding or merely passing or worse? There are others of you who are merely passing or worse are failing. Some of you have let things get away from you. You are learning time management because you are juggling work, school, a family and social life. Settle it in your mind that you want to pass and achieve the highest grade possible. Set up a schedule for homework and assignments. You may have to reschedule your work life so that you have more time to do school assignments. Are you behind in your studies? Have you scored poorly on one or more writing assignments? It is not too late. You should not give up. Now is your chance to get back on track. Speak with your professor and explain your situation. Tell the truth. If you are honest, chances are the professor will give you a chance to hand in assignments and pass. If you put it off, it could mean your failure. Unless you have handed in nothing and/ or failed everything thus far, you have a chance of passing. Plan a schedule of how you will catch up your assignments. Present your plan to your teacher. This shows you are serious about putting forth your best effort. Make a list of your errors as indicated on your assignment, such as comma splice, spelling, pronoun agreement etc. Use your computer program or the internet search engines to look up the rules for these errors and how to eliminate them. Do the exercises recommended in your computer program. Ask your professor if you do not understand how to make the correction. Welcome to this launch of a website dedicated to college and university writing and writers. There will be advice,special tips and mini lessons for students of writing. 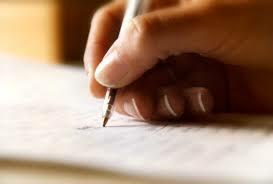 The writing includes essay, busniness, technical and creative . We will also discuss issues in education and technology. I welcome your input . I have included some links that will connect you to other writers and experts on writing. It’s summer right now so most college and university students are on vacation. If you are not on vacation, you are busy writing final papers. Be sure to come back and visit in the Fall.